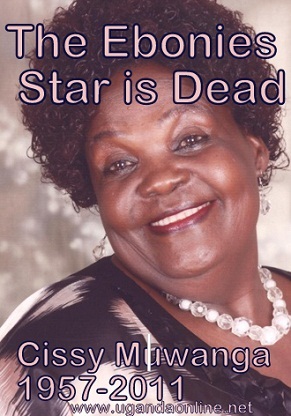 The Ebonies are mourning the passing on of one of the longest serving members Cissy Muwonge commonly known as 'Matron' in Bibaawo and Mama Nakawunde in the That's Life Mwatu series which were popular series back in the 1990's. She was admitted at International Hospital Kampala in May 2011 and since then she has been battling with a clot on her leg which left her paralyzed according to Sam Bagenda aka Dr. Bbosa. Her body was at National Theatre from 6:00pm fro public viewing. She died at the age of 57, joined the Ebonies 29 years back and before that she was a teacher. She will be buried at Lutengo, Kayunga on Wednesday.